Philadelphia’s central role in the birth of a new nation is not to be underestimated. But the commemoration of the Declaration of Independence, the work of the Continental Congress, and the writing of the Constitution in the city have tended to overshadow the ways in which the Philadelphia region’s entire story is in many ways America’s story. The topics here explore Greater Philadelphia’s central place in an expansive American narrative. Camden County Historical Society (Explore in Insurance). Library Company of Philadelphia (Explore in Ladies Association of Philadelphia). Historical Society of Pennsylvania (Explore in African American Migration and Mother Bethel AME Church). Library of Congress (Explore in Political Parties, Origins). Library Company of Philadelphia (Explore in Banking). Library of Congress (Explore in Knights of Labor). Historical Society of Pennsylvania (Explore in Great Depression). Special Collections Research Center, Temple University Libraries (Explore in National Freedom Day). National Archives and Records Administration (Explore in World War II). 1777: Congress drafts Articles of Confederation (ratified by states, 1781). 1790: Philadelphia becomes Capital of the United States for a ten-year period. While meeting in the County Court House (Congress Hall), U.S. Congress passes Naturalization Acts, a Fugitive Slave Act, and the Alien and Sedition Acts. First federal census counts 44,096 residents in the city of Philadelphia and its adjacent suburbs of Southwark and the Northern Liberties, making it the most populous urban center in the new nation. 1790s: First political parties form. 1791: First Bank of the United States founded (pictured here). 1794: Bethel Church founded; grows by 1816 to become anchor of African Methodist Episcopal denomination. 1800-1830s: Facing competition from Baltimore and New York, Philadelphians build turnpikes, canals, and railroads to the interior and other cities. 1816: Philadelphia agrees to buy State House (Independence Hall, shown here in 1815) from state of Pennsylvania, saving block from being developed into building lots. Steeple restored, 1828. 1833: American Anti-Slavery Society founded in Philadelphia. 1840s: Best-selling novel The Quaker City (1844), by George Lippard, depicts Philadelphia as a city of violence and debauchery. In 1847, Lippard’s fictional Legends of the American Revolution associates Liberty Bell with the Declaration of Independence. 1840s: Steamship service and telegraph lines connect Philadelphia with other East Coast cities. 1840s: Nationally circulated magazines published in Philadelphia, including Godey’s Ladies Book, offer guidance for genteel behavior. 1850s: Fugitive Slave Act of 1850 leads to hearings for accused fugitives in Independence Hall. 1854: Candidates of anti-immigrant American Party prevail in city elections; create shrine to Founding Fathers in Independence Hall (1855). 1856: First national convention of Republican Party held in Musical Fund Hall. 1858: Railroad extends from Pittsburgh to Chicago, linking Philadelphia to the West. 1861: Abraham Lincoln visits Philadelphia en route to inauguration in Washington; in 1865, body lies in state in Independence Hall. 1861-64: Although divided by opinions toward slavery, region rallies to Union during Civil War. Industries manufacture uniforms, munitions, and warships; Philadelphians treat wounded and raise funds at Great Central Fair (shown here). Camden and Philadelphia serve as transit points for troops. 1870: In first election after passage of Fifteenth Amendment, federal troops sent to Philadelphia and National Guard to Camden to protect African Americans attempting to vote. 1871: Philadelphia Athletics baseball team plays in first professional league, National Association of Professional Baseball Players. 1876: Centennial of Declaration of Independence marked by Centennial Exhibition in Fairmount Park and creation of National Museum in Independence Hall. Susan B. Anthony calls for equal rights for women. 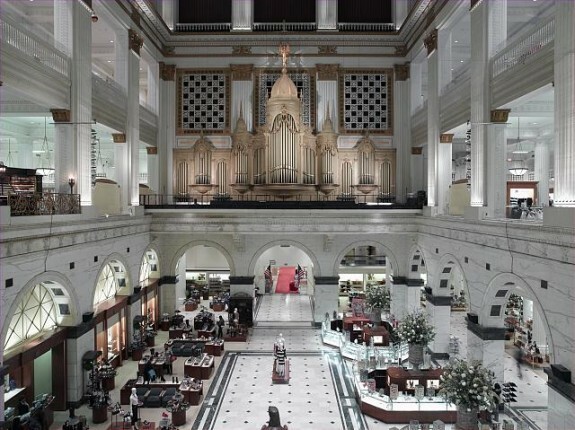 1870s-90s: Market Street department stores, led by John Wanamaker, become national models. 1887: Centennial of U.S. Constitution (parade shown here). Great Migration from the South, especially during and after the world wars, increases the region’s African American population. 1903: Philadelphia described as “the most corrupt and the most contented” of American cities by Lincoln Steffens in McClure’s magazine. 1911: President William Howard Taft gives dedication speech for new Wanamakers department store building (shown here). 1913: Pennsylvania Emancipation Exposition, held in South Philadelphia, marks fiftieth anniversary of Emancipation Proclamation. 1914-18: Region’s ship builders and other manufacturers help to supply the Allies in the First World War. 1926: Sesquicentennial International Exposition (shown here) marks 150th anniversary of Declaration of Independence. 1930s: During Great Depression, many embrace idea of strong federal government to maintain prosperity; federal public housing addresses housing needs. 1936: Democratic Party holds national convention in Philadelphia. Republicans follow suit in 1940. 1941-45: Region’s industries become an “arsenal of democracy” for World War II. 1942: First observance of National Freedom Day (February 1), created in Philadelphia to mark Thirteenth Amendment to U.S. Constitution. 1948: Republicans, Democrats, and Progressives all hold national conventions in Philadelphia. 1948: Congress authorizes Independence National Historical Park (shown here, 1966). 1950s-70s: Federal urban renewal projects and interstate highways reshape city and region. 1952-63: Philadelphia-area teenagers influence national youth culture on American Bandstand. 1985: MOVE bombing draws national attention. 2000: Republican National Convention held in Philadelphia. 2001: Security tightened in city in response to 9/11 attacks. 2003: National Constitution Center opens (shown here). 2008: Phillies win the World Series. 2016: Democratic National Convention held in Philadelphia. 2018: Eagles win the Super Bowl. Gallman, J. Matthew. Mastering Wartime: A Society History of Philadelphia During the Civil War. New York: Cambridge University Press, 1990. Hutchins, Catherine E. Shaping a National Culture: The Philadelphia Experience, 1750-1800. Winterthur, Del. : Henry Francis Winterthur Museum, 1994. —–. Forging Freedom: The Formation of Philadelphia’s Black Community, 1720-1840. Cambridge, Mass. : Harvard University Press, 1988. —–. Urban Crucible: Social Change, Political Consciousness, and the Origins of the American Revolution. Cambridge, Mass. : Harvard University Press, 1979. Sautter, R. Craig. Philadelphia Presidential Conventions. Highland Park, Ill.: December Press, 2000. Independence National Historical Park Library and Archives, Merchants’ Exchange Building, 143 S. Third Street, Philadelphia. National Archives at Philadelphia, 900 Market Street, Philadelphia.